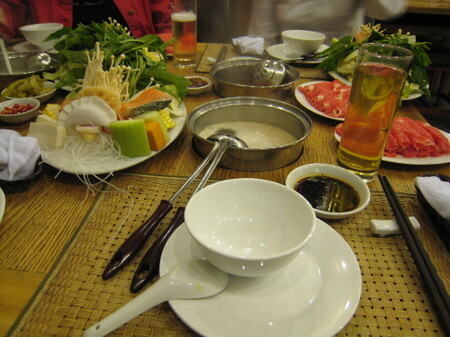 Picture: healthy, yummy and fun to eat - Vietnamese Hot Pot (or steamboat as the Chinese would call it). Among my favorite Vietnamese dishes is the hot pot (or steamboat). The concept is simple and can be found across South-East Asia: a hot pot with bubbling savory soup, lots of vegetable and salad, sea food and beef that all are quickly cooked in the pot. The food is then eating with a salty sauce that reminds me of very strong broil. This dish is tasty, light, healthy and fun and is served in many restaurants around Hanoi and Vietnam. 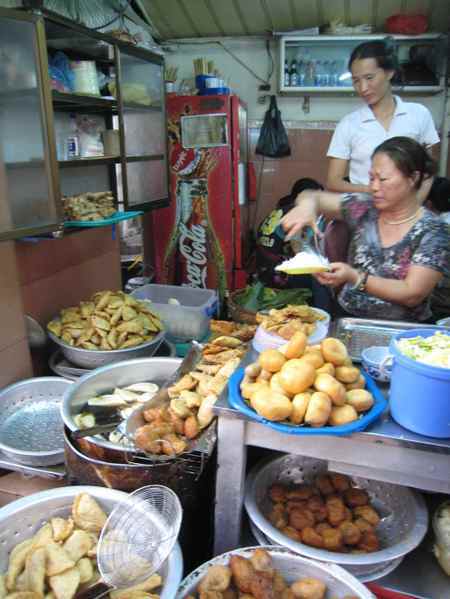 The most original way of eating in Hanoi is in the streets at the many food stalls selling deep-fried ware and noodle soup. If you do not want to squat on little plastic chairs right next to the road I can recommend the many Westernized restaurants and cafés around the St.Joseph’s church. And if you feel like splurging many upscale restaurants around the opera offer a wide-array of food ranging from Vietnamese to Italian. PS: An insider-tip is the buffet at the Sofitel Metropole Hotel. Well, it is not a bargain but worth the atmosphere. 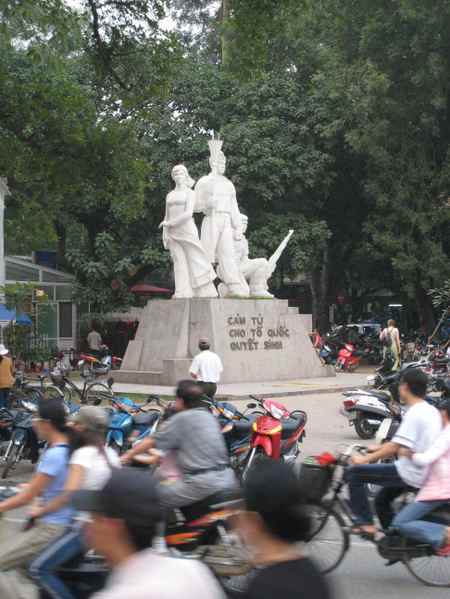 Picture: Hanoi, going strong and still called Communist. People often ask me if they should go to Ho Chi Minh City (Saigon) and leave Hanoi out. Well, if you want to see Ho Chi Minh (or Uncle Ho) you gotta go to Hanoi anyhow as his mausoleum is there. But this is not the only reason why I prefer Hanoi over Saigon. The foremost reason is that Hanoi still feels like Vietnam and Saigon more and more like Bangkok. Whereas Saigon is a booming metropolitan, Hanoi still is oozing history and you can get a taste of the colonial times in the old quarters around the opera. The cultural heart of the city stretches around the old French-built opera house and the colonial Hotel Metropole operated by Sofitel. With the many galleries and the classy restaurant Hanoi beats Saigon by lengths. With its temple of literature and the embassy district Hanoi still retains its ancient day charms and mesmerizes visitors with its wide-array of superb cooking. So if you ask me, Hanoi beats Saigon hands down. Picture: School children practising parading in front of their school (and the St.Joseph's Church). Across Asia, the pyjamas have been widely adopted as the favourite lounging outfit for ladies. In contrast to its use in the West where people only wear them at home, Asians regard PJs as leisure and night wear also to be worn outdoors (here a mom is waiting for her kids in front of a school). 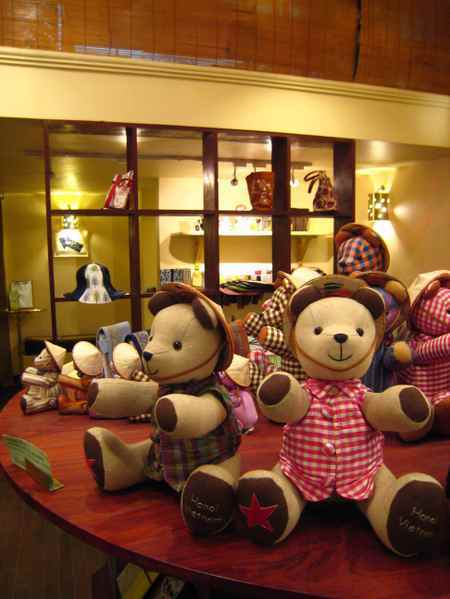 Picture: hand-made silk-bears in the Nagu shop off St.Joseph's Church, Hanoi. Vietnam is rapidly becoming one of the worldwide leading producers of textiles. 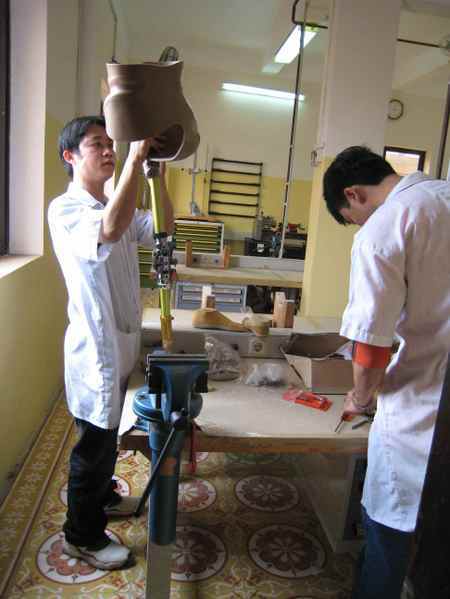 It is drawing upon a big pool of handicraft skills across Vietnam. 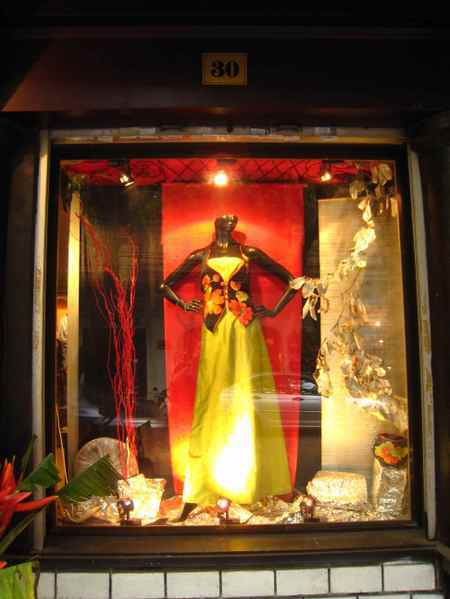 For example a Vietnamese handbag shop,Ipa-nima,produces beautifully embroidered handbags for retailers worldwide.Ipa-nima now has a centrally located shop on Tha Tho (in front of the central St.Joseph’s Church). Also on Nha Chung Road one can find some excellent handicraft shops selling quality products from silk clothes to ceramics and the ever omnipresent paintings. Only two minutes from Hoan Kiem Lake shopping aficionados get a rich hunting ground for their activities. I am a dedicated city-walker as I love to discover hidden corners and take in the many sights and smells of any city (and I guess I am lucky to have an excellent sense of orientation). Anytime someone asks me to go for a walk I am up for it. 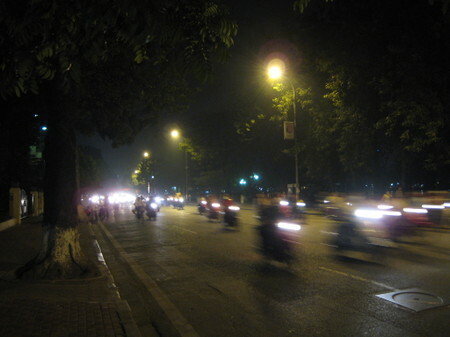 Vietnamese love to go for a walk especially at night time when the heat has cooled down a bit. Only that they add the modern twist of actually using a motorbike and yes, it is still called “going for a walk” (the Cambodians say the same). Not what I had in mind though. 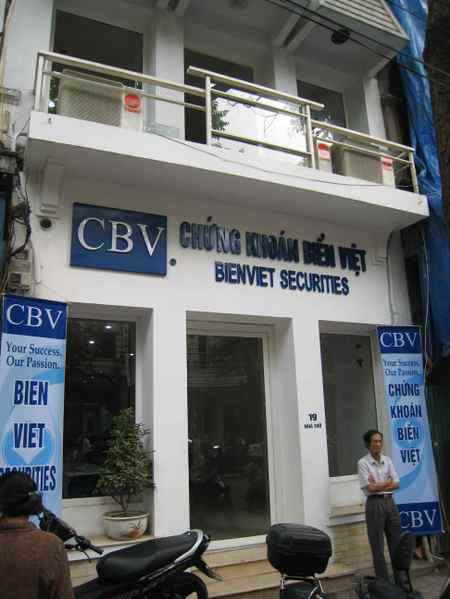 Picture: a stockbroker in Hanoi. Revisiting Hanoi, which is still lacking in business-drive behind Ho Chi Minh City (Saigon), gives an immediate idea of the boom currently happening in the Vietnam: noise everywhere! 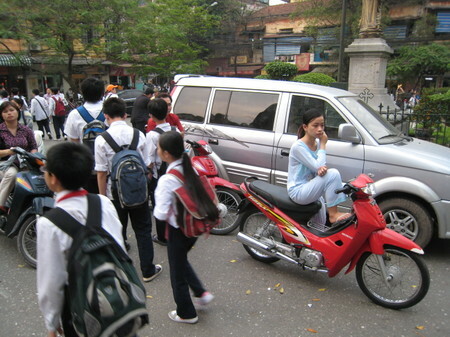 Thousand of new motorbikes and even new BMW and Mercedes cars now roam the city of Hanoi and block the roads. A second sign of the second fastest growing economy in the world behind China (in the first quarter 2007 put the GDP growth at 7.7%) is the incredible raise in the stock market by 146% in 2006. The future joining of WTO should additionally boost the economy. New banks are popping-up everywhere and so are stock brokers. With 82mio. people Vietnam is clearly one of the loudest roaring tigers in Asia. 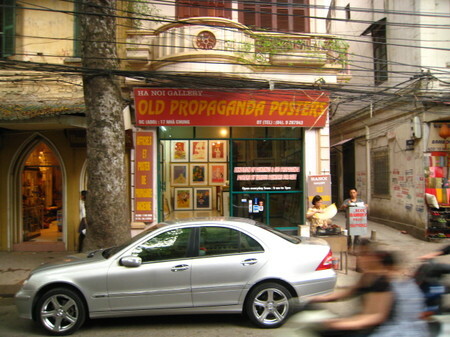 Picture: Old propaganda meets new commersialism in Hanoi. 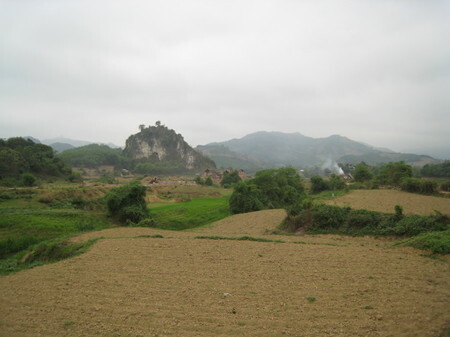 About two hours north of Hanoi the scenery changes from flat land to scenic mountain formations and bendy roads and I was relieved to escape the noise and traffic jams of Hanoi. The picturesque green mountains among bamboo forests are framed by hundreds of deep green rice paddies and gentle buffalos grazing in them. I was lucky enough to see those bizarre mountain formations at their very best: covered in mist that makes them look like on a classical Chinese scroll painting. 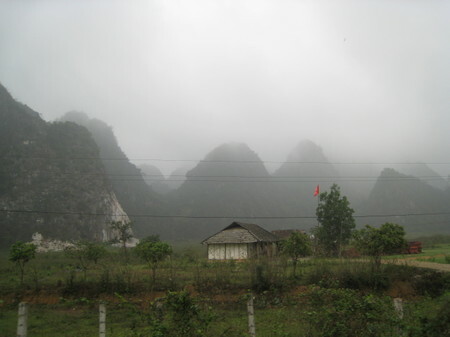 It eminded me a lot of the famous Guilin Mountains in China, just no tourists. Picture: The government rehab centre in Tuyen Quang, North Vietnam, where children receive physiotherapy. Together with representatives from Greencross and KADO, a Cambodian NGO, I traveled 3.5 hours to the North of Vietnam (about 150km from the Chinese border) to Tuyen Quang, a city with about 70’000 inhabitans. There Greencross supports a local rehabilitation centre operated by an energetic and determined Vietnamese doctor, Dr. Ha. The Agent Orange affected children with disabilities are not only given treatment and rehabilitation but also are given cows in the form of a microcredit, therefore providing a living for the whole family. We visited four families with between four to six children who were mostly disabled, mentally and/or physically. All fathers of the families were soldiers in the Vietnam War and exposed to Agent Orange. One father had three disabled children out of four and told us in tears that without the cow, from the already repaid microcredit, he would not know how to survive. Similar to the effects of exposure to radiation (like in Tschernobyl) Agent Orange alters the genetic setup of humans. So far no one knows how long the severe effects will last. In some families the disabilities only show in the second generation. It seems that the war will last much longer in Vietnam. Picture: A young girl is put in a cast to manufacture a tailor-made corset in order to treat her deformations. The Vietnam War has been over for over thirty years but for many people and especially children it still lives on. The US Airforce used during the war a chemical called Agent Orange which de-foiled the jungle and therefore many Vietnamese soldiers were exposed to this aggressive chemical. The long-term effects are genetic transformations in their children so that they have mental and physical disabilities. 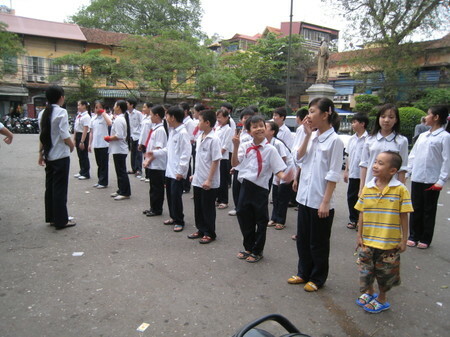 One specialist centre which treats such children according to international standards is the Vietcot Centre in Hanoi. On one hand it treats children and on the other hand it trains teenagers in prosthesis and orthopedics. With orthopedics and prosthetics those children are given another lease of life and at the same time gives support the burdened parents. And the help comes cheap: a child can be completely treated for less than 1’000$. The centre receives support by the NGO Greencross with headquarter in Geneva, Switzerland. Picture: Young rehab centre staff working on a prostethics with international equipment. If you feel like taking a rest and pamper yourself to marvelous food in Saigon after a hard day of sight-seeing, seek no longer and go to the Créperie & Café Restaurant located on a lush avenue between the Re-unification Palace and the Notre Dame Cathedral at Thien Ha Avenue. We had some excellent sandwiches and home-made ravioli with a spicy tomato and herb sauce and the waiters are cheerful and lightning-fast. Just fabulous!